Since 2001, Northpoint Christian School has given students the opportunity to participate in international and home missions classes and trips. International Biblical Studies class – In the International Biblical Studies (IBS) class, students must be accepted through an application process that in volves recommendations from parents, teachers and ministers. In the classroom the students focus on missions, the historical involvement of the Church in missions and service, and the call to missionary service. Outside the classroom the students must raise their own money to participate in an extended trip with the class to another country to perform service. In the past few years the IBS class has traveled to Austria, Brazil, China, Russia, Guatamala, Romania, Trinidad, Dominican Republic, Jamica, Italy, and Costa Rica. Home Missions class – Home Missions Discovery is a great opportunity for students to actively grow in the Great Commission regionally in the United States. In addition to the semester of classroom work, the class will spend nearly a week ministering in an urban community. Past trips have ministered in St. Louis, Chicago, and, more recently, in Nashville. Students may have hands on experience working in the city mission, serving food to less fortunate, taking part in out-door services for homeless people, working in outreach warehouses, coordinating prayer surveys, and playing with children in needy areas. The Lord has blessed Northpoint students as they have grown in courage and urgency to help those hurting and those who need the gospel of Jesus Christ. 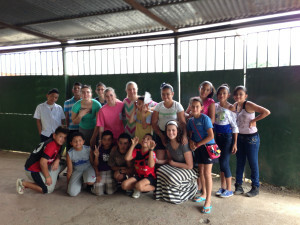 This experience gives the students a unique national and cross-cultural perspective of missions. Application to be a part of the class are made available and due typically in mid-April of the second semester.